Papua New Guinea Foreign Affairs and Trade Minister Rimbink Pato has invited South Korea to pilot renewable energy projects in PNG. 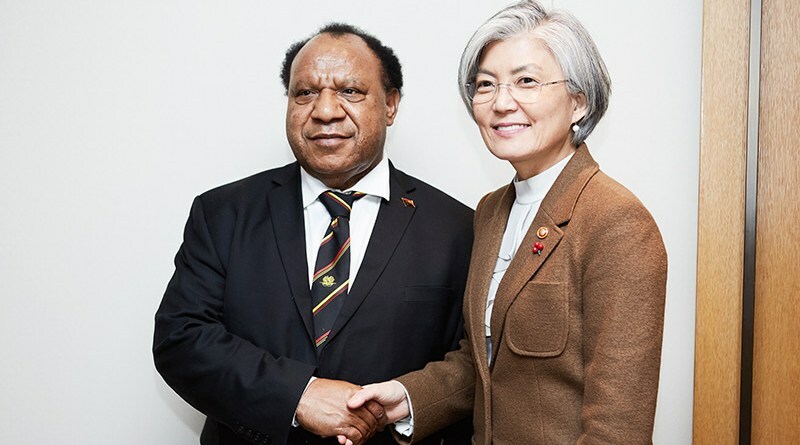 Mr Pato issued the invitation during a meeting this week between the Foreign Ministers of the Pacific Island Forum and the Republic of Korea in Seoul. He said PNG is an ideal place to test a variety of renewable energy projects, examples of which he saw in Seoul last week. “In the Pacific, we have the ocean, huge waves, wind, sun, boiling pools for thermal power and waste,” said Mr Pato, who expressed gratitude for the “tremendous work” the Korean International Cooperation Agency (KOICA) and the Korean Development Fund is doing in the Pacific. He said South Korea could also pilot schemes elsewhere in the Pacific after taking into account any selected country’s size, remoteness, population and economy. “We suggest that South Korea consider sending a scoping mission to PNG and to other selected Pacific countries to see what options are available,” he said. Mr Pato’s invitation came after a bilateral meeting with the new Foreign Minister of South Korea, Madame Kang Kwung-wha, who rose to international prominence in senior roles at the United Nation before her current appointment. At that meeting, Mr Pato invited the Minister for Foreign Affairs of the Republic of Korea to the 2018 APEC Leaders’ Summit in PNG, and Madame Kang confirmed their attendance. Mr Pato also asked South Korea to help in the preparations for APEC. Earlier during a courtesy call on the President of the Republic of South Korea by PIC Foreign Ministers following Mr Pato’s report on progress of APEC preparations, the President confirmed his attendance and proposed to meet the Pacific Island Leaders in Port Moresby in next November. Mr Pato also sought South Korean support for initiatives in the forthcoming World Trade Organization Ministerial Meeting to organize access to World Bank funds to boost resilience in the Pacific to climate change. This would happen if the Bank’s definition of “fragile states” were extended to those states suffering severe impacts from climate change. In line with PNG’s Foreign Policy theme of connectivity, Mr Pato suggested Korean Air begin flights to PNG and through code-sharing arrangements foster people-to-people connection and trade and investment. He said PNG is impressed at the development of South Korea in the decades after the war on the Korean Peninsula, and wanted to make progress by learning it and via support based on connectivity.